Gravity Forms eWAY Pro v1.1.2 has just been released. This release adds bulk actions for setting feeds to Live or Test, and fixes a few bugs. If you have a form with two or more eWAY feeds on it, changing them all to Test mode so that they all go through the sandbox, and then changing them back to Live, can be a little tedious. It’s also something you would typically want to do pretty quickly. 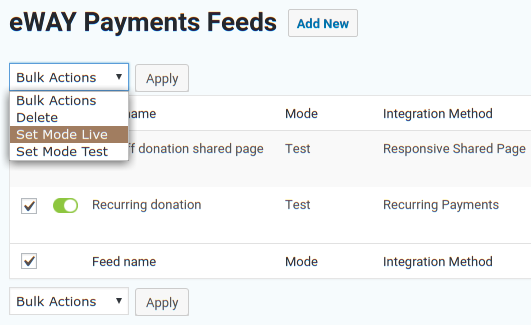 Now you can change all eWAY feeds for a form to Live or Test with one bulk action. You can now use the Authorise (PreAuth) method with Token Payments. Previously, you could only use the Capture method to charge your token customer straight away, but now you can Authorise a transaction for completing later in MYeWAY. This is useful for drop-shipping and other situations where you just want to ensure that the transaction can be captured. There’s a restriction, however. If you’re creating a new token customer using the Responsive Shared Page, and processing a transaction at the same time, that transaction can only use the Capture method. You can use Authorise if you’re using a Direct Connection (i.e. credit card field on your website), just not with the Responsive Shared Page. I use Easy Digital Downloads to manage my shop, and delivery of plugin updates from it. The fine people from EDD discovered a performance problem created by W3 Total Cache when it was configured to mess with object caching. This release includes code to work around that problem. Of course, this work around only fixes the problem for plugins that use EDD Software Licensing. If you use W3 Total Cache and have its object caching thing enabled, I recommend you disable it. Or ditch that plugin and use something better like WP Super Cache or WP Rocket. A customer discovered that when they used the Members plugin to fine-tune their WordPress permissions, this add-on’s Settings and Form Settings menu items disappeared. You can read all about it in my blog post, Gravity Forms add-ons need to have capabilities. This release includes that fix!